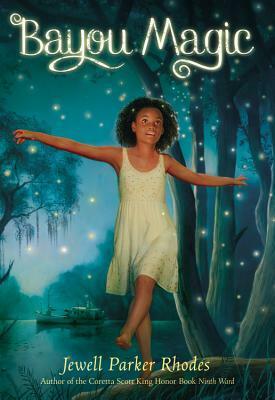 Bayou Magic by Jewell Parker Rhodes. Grades 4-6. Little, Brown Books for Young Readers, May 2015. 239 pages. Review copy provided by my local library. Every summer, Maddy's Grandmere invites one of the grandchildren to spend the summer with her in the Bon Temps bayou. Maddy's older sisters have not been excited about this, telling Maddy that their grandmere is a witch, that it's boring in the bayou with no TV or electricity. But Maddy feels differently. Although she's a little intimidated to spend the summer so far from her home in New Orleans, she feels a connection with Grandmere as soon as she arrives. As Maddy explores the bayou and learns about the legends of her ancestors, she comes to realize that she has a second home here and a special role to play. But as Maddy's dreams turn dark, dripping with oil, she fears that something bad is coming to the bayou and she can only hope that she will be brave enough to stop it. This book is a love letter to the Louisiana bayou. Vivid sensory details bring the flora, fauna, and folk of the Bon Temps bayou to life for the reader. You can taste the jambalaya and moon pies, you can hear the frogs calling, you can see the fireflies dancing through the trees. A strong environmental message comes through, urging young people to come forth as stewards of our world. The book's a bit loosely plotted and I found myself wondering where it was going at times, but I enjoyed the ride. Maddy's role in the Bon Temps community is revealed as the story unfolds and her relationships with her Grandmere and with a neighbor boy Bear develop. This is a strong story about knowing your roots and embracing where you come from and your role in the greater world. Readers who enjoy the strong bayou setting may also enjoy The Time of the Fireflies or The Healing Spell by Kimberly Griffiths Little. Armchair travelers who enjoy reading luscious descriptions of places may also like The Turtle of Oman by Naomi Shihab Nye. Readers who like reading about Maddy's journey to get to know a little-known family member and figure out where she fits in with her family might also enjoy The Blossoming Universe of Violet Diamond by Brenda Woods. And readers captivated by the mermaid mythology may enjoy Ingo by Helen Dunmore.